White and Williams was honored to host Natalie Cooke, a Washington Ireland Program (WIP) student, for her summer semester work placement in our New York City office. 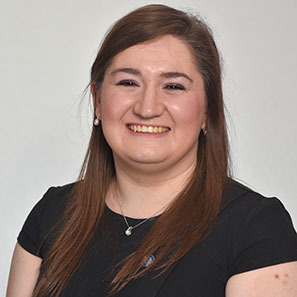 Natalie spent six and a half weeks working with lawyers in multiple practice groups on a variety of projects and learning about different areas of the law. White and Williams is among the first companies hosting students in New York, as the program recently celebrated its expansion into the city. "We have been delighted with the support that White and Williams has offered the Washington Ireland Program for our inaugural year in New York," said Andrew McCullough, WIP's Director of Communications. "It was immediately obvious that White and Williams shared our commitment to excellence and leadership, and it has been a pleasure to work with them." WIP inspires and develops promising leaders through a program of personal development, policy debate and community service. White and Williams Partners Tom Butler and Nicole Sullivan, who have experience representing Irish clients in a range of business matters, have close ties to WIP and were instrumental in facilitating Natalie's placement with the firm. With a specific interest in implementation of internet era legislation and its integration in real life scenarios, Natalie worked closely with the firm's Cyber Law and Data Protection Group, including assisting on a white paper exploring the intersection of recent European Union GDPR legislation and Cybersecurity Threat Intelligence and Threat Sharing Initiatives. Natalie also performed legal research on civil procedure rules and case law related to business dissolution and contract disputes and accompanied lawyers to the courtroom to sit on negotiations and trials. "Being given every opportunity to see as many different aspects of the law as possible" has been a highlight of Natalie's experience. "I've also enjoyed getting to know the other associates and partners at White and Williams and learning about their journeys into the law," she said in a Q&A about her time with the firm and in New York. To culminate the summer semester work placement, Partner John McCarrick, along with Tom, Nicole, and White and Williams, hosted Natalie and the rest of WIP's New York students for an evening of dinner and discussion at the Union League Club in New York City. Speakers Jack Devine, author and former Acting Assistant Director of the CIA, and Kathleen Begala, Chair of the Board of Directors of the Irish Repertory Theatre, led the discussion on the theme of leadership in difficult times. In addition to John and Natalie, White and Williams was represented by Managing Partner Patti Santelle, Partners Tom Butler and Nicole Sullivan, Associate Shruti Panchavati and Summer Associate Sabina Yevdayeva. 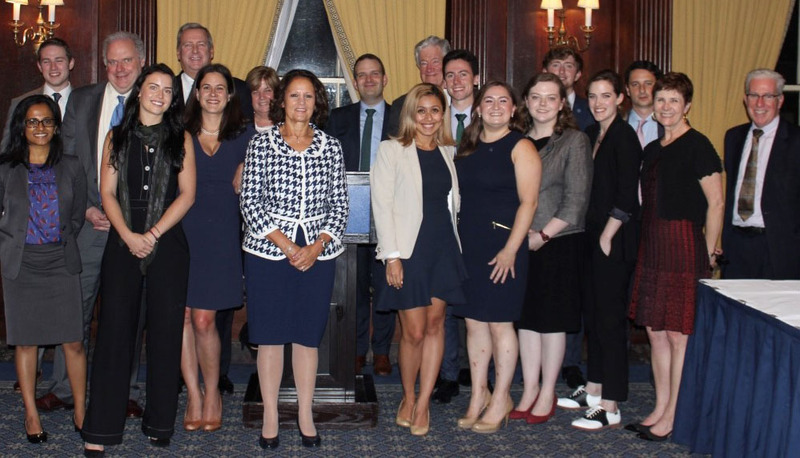 WIP students and representatives with White and Williams lawyers and speakers Jack Devine and Kathleen Begala at the Union League Club in New York City on Tuesday, July 24.